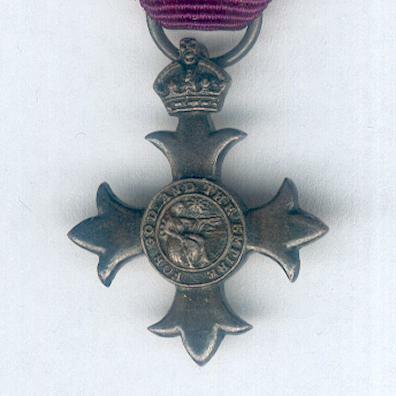 Miniature silver cross patonce with Tudor crown suspension; the face with a circular central medallion with Britannia seated, her left arm extended, a radiant sun above right, within a ring inscribed ‘FOR GOD AND THE EMPIRE’; the reverse with a circular central medallion with the crowned cipher of King and Emperor George V within a rope border; diameter 19.674mm (0.77 inch); age-toned; on original ribbon. 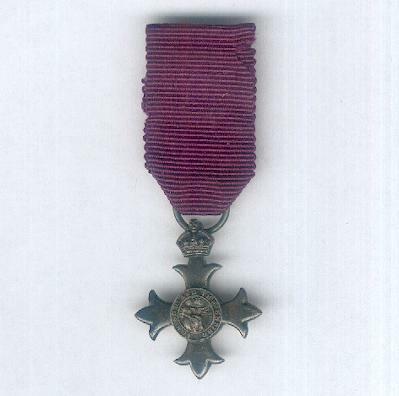 The Order was instituted by King George V on 4 June 1917 in five grades to acknowledge the service of non-combatants during wartime. In 1918 the Order was divided into Civil and Military divisions. This example is of the first type with Britannia on the face; since 1935, the Order has had the head and shoulders portraits of King George V and Queen Mary facing left on the face. 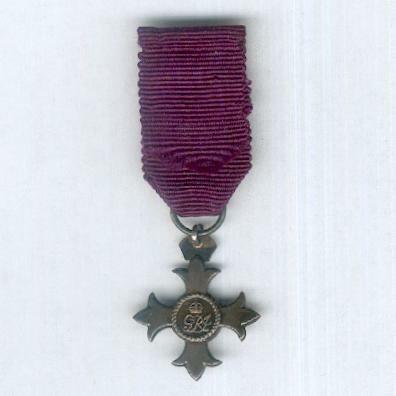 Today the Order is awarded for distinguished service in any sphere of activity and honorary awards may be made to foreigners.